I have been a teacher for 25 years, a Headteacher for 10 years and, at the age of 49, this much I know about asking less (but better) of everyone in school (aka coherence). Less is more, always. I think it is really important that we ask less of everyone in schools; when I say less, I mean reduce to the bone what we all need to do so that everyone single one of us can concentrate on making our teaching as good as it can possibly be. It follows that if we are asking less of people, what we do ask for has to be of an excellent quality. Institutional coherence in schools stems from the accurate interpretation of your students’ performance. John Jacobs, one of the greatest ever golf coaches, used to say that the best way to interpret what was happening with your golf swing was to study the flight of your ball when you hit a shot. 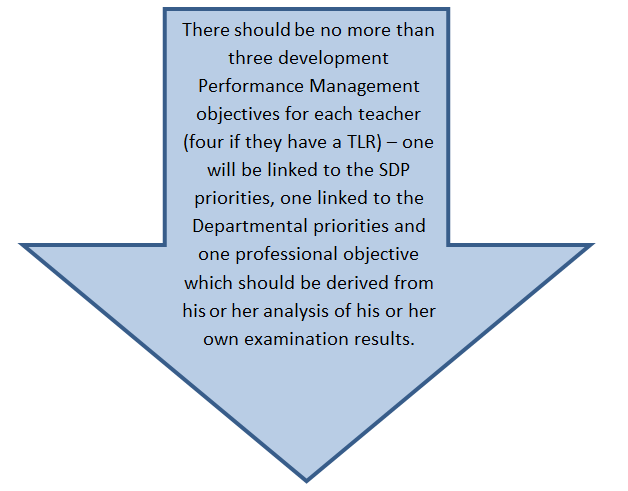 The parallel with teacher improvement is perfect – a forensic analysis of our students’ results using all the intelligence available (and with the examination boards’ on-line post-results services, combined with our understanding of the combinations of flesh and blood that produced those results, and copious amounts of our own wisdom and judgement, we have all we need) is a great source of evidence for understanding how we need to modify our teaching to improve our students’ performance. Keep the key processes of school improvement aligned. 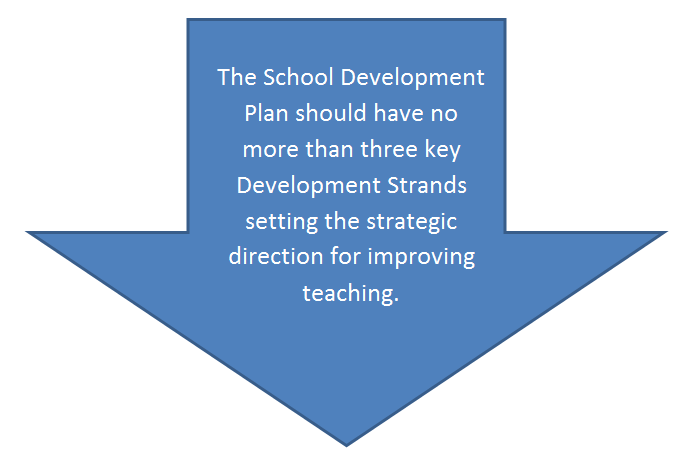 Begin by setting the school’s strategic direction for improving teaching (click on the graphic below for our slender SDP 2013-16). Once you know what you need to do, don’t be diverted. 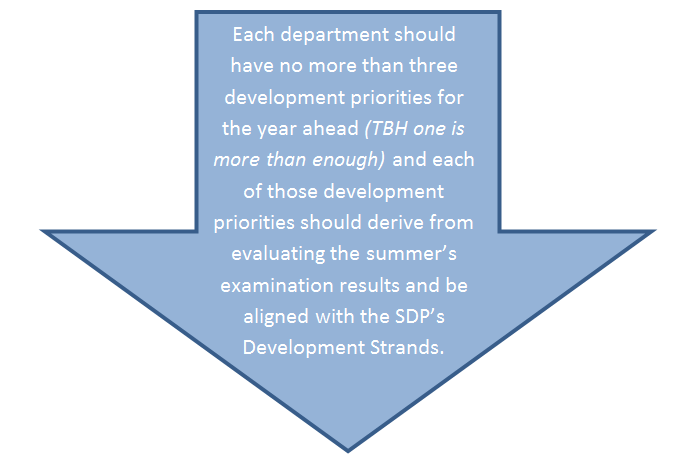 All the Departmental development meetings for the year will focus upon the (no more than) three development priorities. Do the admin some other way and keep your teams focused upon the collaborative development of teaching skills. I’d be really interested to know how you restructured the school timetable! Alternate Mondays we have 5 x 50 minute lessons (instead of 60 minute lessons) and shorter breaks/lunchtimes to send students home an hour early. Add that gained hour to the meeting hour and we have two hours of CPD time – 2.45pm-4.45pm.